Despite the difficult time for the Ukrainian economy, the country continues to have investment potential in the agribusiness sector, energy and IT sector. The potential of IT industry in Ukraine is far from exhausted. Calculations show that the capacity of the industry is from $ 15 billion to $ 30 billion. At the same time the full potential of IT-industry will be able to open only because of one condition: Ukraine will encourage developers to generate ideas and create products here, “home” and not seek every opportunity to develop and resell themselves abroad. Ukraine is also a major transport and transit hub, connecting Western and Eastern part of Europe, the Baltic and South-West Asia. Foreign legal entities (individuals) can purchase and sale any real estate together with land (expect agricultural land) in Ukraine as well as get commercial benefit from their property and let it on lease, while paying due taxes. According to the applicable laws of Ukraine sale of agricultural lands is in moratorium until 2018. Employers are liable to pay Unified Social Security Contributions. 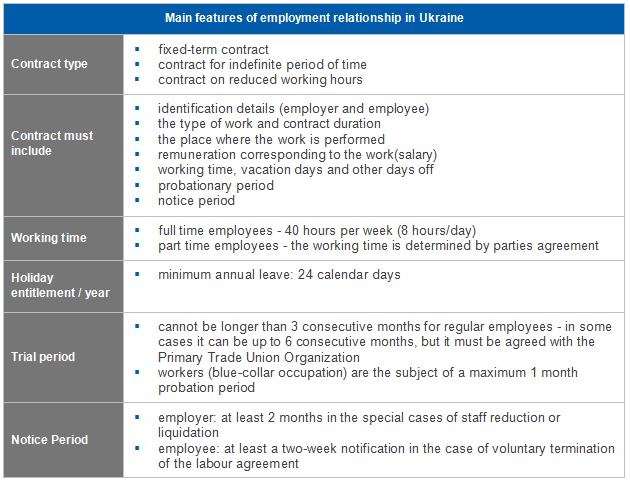 The social security contribution in Ukraine is 22% of the gross earnings (salaries and benefits paid to employees). This percent is applied to salaries which are less than 25 subsistence minimums for able-bodied persons. If the salary is higher, then only the amount up to 25 subsistence level for able-bodied persons is taxable, while the rest is non-taxable. The subsistence level for able-bodied persons in Ukraine is UAH 1,600 (approx. EUR 55) starting January 1st, 2017. The 22% from gross salary is divided among different funds (unemployment fund, accident fund, pension contribution and temporary disability fund). Ukraine’s standard CIT rate is 18%. There is an additional tax for insurance activity – 3% or 0% on the income of these companies. The contracts with term life insurance, a voluntary health insurance and insurance contracts within the non-state pension have the rate 0%. Legal entities involved in gambling have to pay special CIT at 10%. The rate 18% can be applied to special gambling activity. This CIT paid from gambling income do not reduce taxable profit of a company engaged in gambling activities, so additionally they have to pay standard CIT 18%. Rates for legal entities-non-residence pay CIT at 0%, 4%, 6%, 12%, 15% and 20% from their income (tax rates varies depending on type of income). Tax rates and taxable profit for permanent establishments are the same as for residence in Ukraine. Taxable income ̶ Taxpayers with an annual income exceeding UAH 20,000,000 have to use adjustments of the financial results for tax difference. Taxpayers with an annual income that does not exceed UAH 20, 000,000 are allowed not to apply adjustments. Tax period – The calendar year. Tax returns and assessment ̶ companies with an annual income up to UAH 20,000,000 must perform the tax return for the whole calendar year until March 1st, 2017. Companies with an annual income exceeding UAH 20, 000,000 must pay and perform tax returns quarterly. 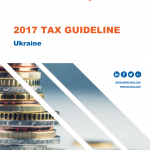 The complete list of deadlines for taxpayers you may find in our “2017 Tax calendar for Ukraine”. Advance payments – companies that are quarterly payers must pay 2/9 CIT from the amount of three quarters income until the December 31st of the following year. This rate also applied to the taxable income received from abroad. Starting from August 2014 1.5% military tax on personal income was introduced in Ukraine. Standard VAT rate in Ukraine is 20% and is imposed on domestic sales of goods and/or services, imported goods or services. 7% – this rate is applied to supply and import of registered medicines and specific medical goods. 0% – this rate is applied to the export of goods. Other services which are subject of 0% rate are an international transport services confirmed by a single international shipping document, toll manufacturing services if the goods are exported from Ukraine, etc. Provision of services to a non-resident are subject to 20% VAT or it can be considered as an outside the scope of VAT, depending on the place of supply. VAT payers must provide the report monthly until the 20th day of the month following the reporting month. Payment of VAT is made within 10 days from the end of the report’s submission, that is, as a rule, up to and including the 30th day. The object of taxation for this tax is land plots owned or leased, as well as land shares that are owned. Land tax rates set by local councils. The rate of land tax depends on the category, location, and the existence of a state valuation for each particular land plot. Starting January 1st, 2017, owners of cars which are not older than five years and with an average market value exceeding 375 minimal salaries as of January 1st of the reporting year (approx. EUR 40,000) must pay transport tax in amount UAH 25,000 for each car per year. Payers of this tax are owners of objects of taxation on the territory of Ukraine: individuals, legal entities, non-residents. tax for apartments of more than 300 m2 and for houses more than 500 m2 – is increased by 25 thousand UAH for each object. Customs duty must be paid by the importer upon import of the goods into Ukraine. The rates are established by the Customs Tariff. Nowadays in Ukraine are two duty rates: relieved and full rates. Relieved rates are applied to goods from World Trade Organization (WTO) and some other countries. This tax is applied for ethyl alcohol, alcoholic beverages, beer, tobacco and tobacco products, cars, car bodies, motorbikes, electricity, liquefied gas, petrol, diesel fuel, other fuel material and electric power. These goods can be imported or produced in Ukraine. Local authorities have the right to set rates of local excise tax, which are taxed by retail sellers of excisable goods. The rate of such excise is set at a rate of 2% to 5 % of the goods value. Starting January 1st, 2013 until January 1st, 2023, IT companies that perform activities in Ukraine are exempted from VAT payments on operations of software products supply. Software products are considered: the result of computer programming in the form of operating system, systemic, applied, entertaining and / or educational computer software (their components) as well as websites and / or online services; cryptographic data protection. Contact our experts in Ukraine!